(Seaside Heights) – As the $265 million project rebuilding Route 35 gets underway, New Jersey Department of Transportation (DOT) Commissioner James Simpson today kicked off the Christie Administration’s “Listening Tour” to get direct feedback from residents, business owners and local officials. Commissioner Simpson and DOT project team members gathered today at Seaside Heights Borough Hall and then walked along streets with Mayor Bill Akers, listening to concerns and ideas from business owners and residents along the way. The Listening Tour supplements a robust community outreach effort that includes a hotline telephone number, 732-230-7356, and email address, restore.nj35@dot.state.nj.us for residents to pose questions or provide suggestions as work progresses. 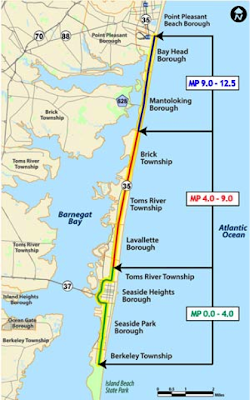 NJDOT has created a project-specific websitethat provides information on the proposed construction activity. The site will be updated as work advances. A pre-construction public information center on July 9 in Lavallettewas very well attended by hundreds of residents and business owners from the eight Barnegat Peninsula municipalities where Route 35 will be reconstructed (Bay Head, Mantoloking, Brick, Toms River, Lavallette, Seaside Heights, Seaside Borough and Berkeley. 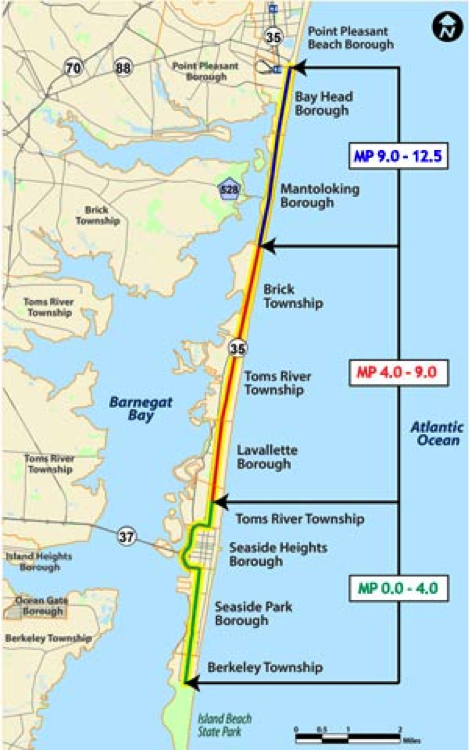 At a groundbreaking event in neighboring Seaside Park on July 2, Governor Chris Christie announced the startof the project to rebuild the roadway that sustained heavy damage during Superstorm Sandy. At the event, Christie said the Route 35 reconstruction project sends a message that the Jersey Shore is coming back stronger than ever. The Department has divided the project into three geographical sections and has awarded contracts to three contractors. Work in all three sections will begin in August. Construction in the northernmost section will be completed by the summer of 2014, with work in the other two sections completed by the summer of 2015.